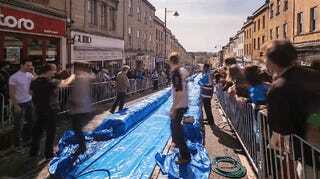 Hey, remember how back in March artist Luke Jerram was raising money to build a 300-foot water slide down a busy street in Bristol, England? He actually got it done. The slide's barriers were built using hundreds of hay bales, and dishwashing liquid was used on the tarps to make things a little more slippery. Thousands of people turned out to watch, with around 360 lucky people picked from over 100,000 applicants to actually ride down the slide.